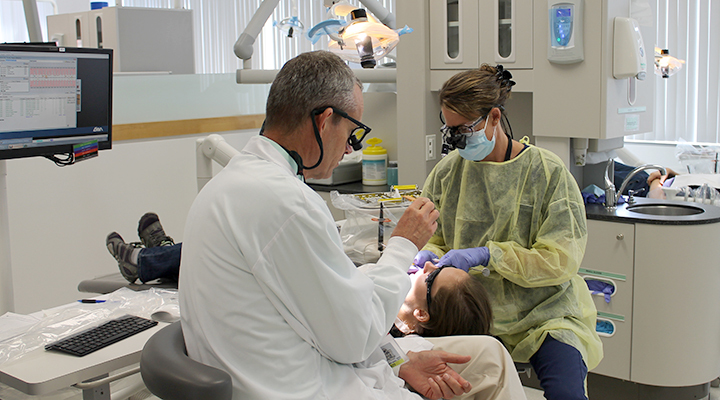 Last month, we introduced you to the Heroes Clinic, a free dental clinic for veteran students at the University of Colorado Denver Anschutz Medical Campus. Maureen came to the Heroes Clinic with black stains on her front teeth. She was very self-conscious of these stains and about to graduate and enter the workforce. She recalled one particularly embarrassing interview where the interviewer thought Maureen had something stuck in her teeth. The appearance of her teeth was adversely affecting her professionally and socially. But after treatment from the Heroes Clinic, Maureen is smiling and feels great about her teeth. Maureen recently updated the clinic and shared some great news: she got a job! 33-year-old veteran Seth came to the Heroes Clinic for his first visit with 8 missing teeth and significant decay. For the last 7 years, Seth struggled to return to normal life after the Navy. He suffered from severe anxiety, so the dentist was especially difficult. On one occasion, he actually had to leave before treatment started because he was so anxious. Since the start of his treatment, Seth has made tremendous progress and now smiles walking into his appointments. He’s grateful he has the opportunity to get his smile back. Randy has always been self-conscious and, according to his wife, rarely smiled. But after visiting the Heroes Clinic, Randy couldn’t stop smiling! His wife later told the clinic that his smile was the best graduation gift, and “he smiles all the time now!” Not only did Randy graduate, he recently accepted a new job and credited his new smile for his success. To learn more about the Heroes Clinic, visit ucdenver.edu. *To protect the privacy of certain individuals, names have been changed.